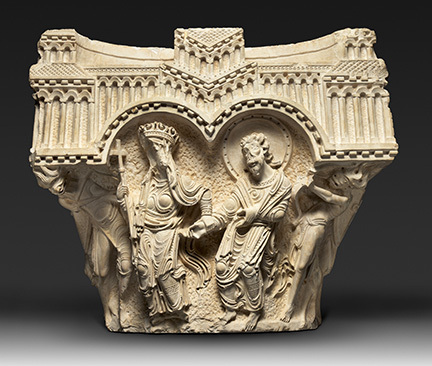 “This exhibition illuminates the key role that the Holy City played in shaping the art of the period from 1000 to 1400. While Jerusalem is often described as a city of three faiths, that formulation underestimates its fascinating complexity. In fact, the city was home to multiple cultures, faiths, and languages. History records harmonious and dissonant voices of people from many lands, passing in the narrow streets of a city not much larger than midtown Manhattan. This is the first exhibition to unravel the various cultural traditions and aesthetic strands that enriched and enlivened the medieval city. Map of the Holy Land. From Chronica majora, vol. I. Saint Albans, England, ca. 1240 – 53. Written and illustrated by Matthew Paris (ca. 1200 – 1259). Opaque watercolor and ink on parchment; 151 fols. 14¼ × 9¾ in. (36.2 × 24.8 cm). Corpus Christi College, University of Cambridge. Pair of Bracelets. Egypt or Greater Syria, 11th century. Repoussé gold sheet, wire, and granulation. a: W. 1¼ in. (3.2 cm), Diam. 2¾ in. (7 cm); b: W. 1¼ in. (3.2 cm), Diam. 2⅝ in. (6.5 cm). 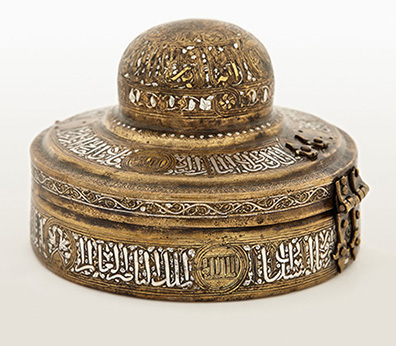 The al-Sabah Collection, Dar al-Athar al- Islamiyyah, Kuwait. Image: © The al-Sabah Collection, Dar al-Athar al-Islamiyyah, Kuwait. 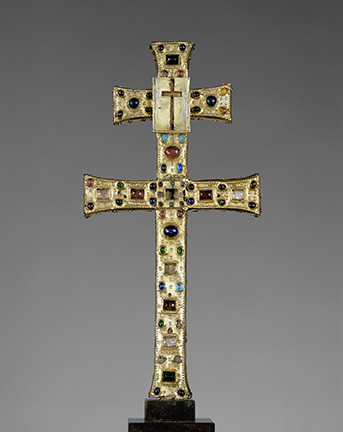 Reliquary Cross. Limoges, probably Abbey of Grandmont, France, ca. 1180. Gilded silver, rock crystal, glass, and wood. H. 11¾ in. (29.8 cm), W. 5 in. (12.5 cm), D. 1 in. (2.5 cm). The Metropolitan Museum of Art, New York, Purchase, Michel David-Weill Gift, The Cloisters Collection, and Mme. Robert Gras Gift, in memory of Dr. Robert Gras. Image: © The Metropolitan Museum of Art, New York. 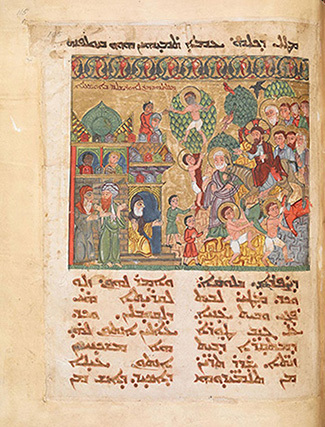 The Entry into Jerusalem (detail) from a Syriac Lectionary. Iraq, possibly Monastery of Mar Mattei, 1216 – 20. Tempera, ink, and gold on paper; 264 folios. 17½ × 13¾ in. (44.5 × 35 cm). British Library, London. Image: © The British Library Board. Jewish Wedding Ring. Germany, first half of the 14th century. Gold. H. 1⅞ in. (4.8 cm), W. 1 in. (2.5 cm), D. 1 in. (2.5 cm). Thüringisches Landesamt für Denkmalpflege und Archäologie, Weimar. Image: Thüringisches Landesamt für Denkmalpflege und Archäologie (photograph by B. Stefan). 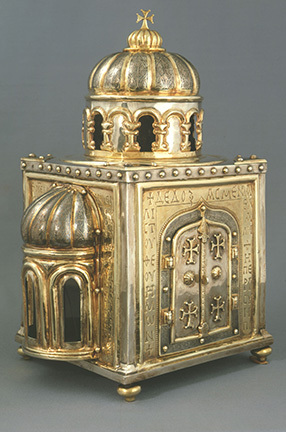 Reliquary of Saint Anastasios the Persian. Holy Land, 969–70. Silver repoussé, gilding, and niello. H. 7¾ in. (19.6 cm), W. 7⅞ in. (20 cm), D. 15⅜ in. (39 cm). Domkapitel and Domschatzkammer, Aachen. Image: © Domkapitel Aachen (photograph by Ann Münchow). The Virgin and Apostle Capital. Early 1170s. Limestone. a. 24½× 28 ⅜× 13 ⅜in. (62 × 72 × 34 cm) b. 16⅝ × 21 ¼× 18½in., 355 lb. (42 × 54 × 47 cm, 161 kg). Terra Sancta Museum, Basilica of the Annunciation, Nazareth. Image: © Marie-Armelle Beaulieu /Custodia Terræ Sanctæ. Goblet of Charlemagne. 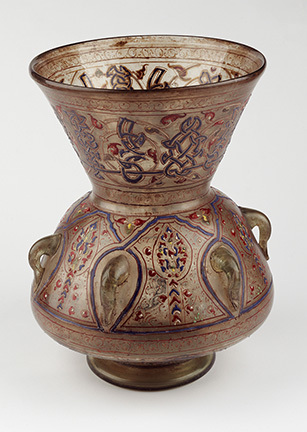 Glass: Syria, second half of the 12th century; mount: France, 13th – 14th century. 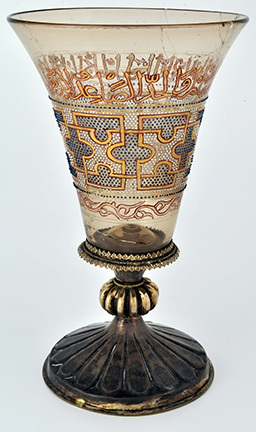 Glass with gold and enamel; gilded silver. H. 9½ in. (24 cm). Musée des Beaux-Arts, Chartres. Image: Cliché Musée des Beaux-Arts de Chartres. 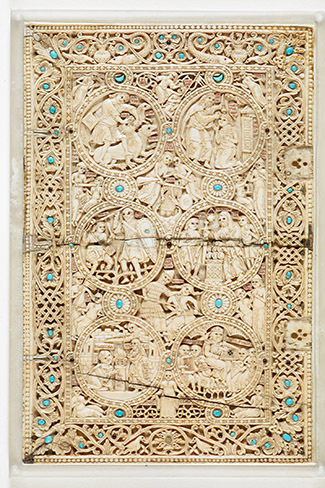 Upper cover of The Psalter of Melisende, Queen of Jerusalem. Jerusalem, Scriptorium of the Holy Sepulchre, ca. 1135. Ivory with semiprecious stones and silk-embroidered spine. 8½ × 5½ in. (21.6 × 14 cm). British Library, London © The British Library Board. Incense Box. Egypt or Syria, 14th century. Brass, gold, silver, and black compound. H. 2⅞ in. (7.5 cm), Diam. 4½ in. (11.5 cm). Museum of Islamic Art, Doha. Image: The Museum of Islamic Art, Doha. Gospel Book. Sis, Cilicia (present-day Turkey), 1346. Written by Nerses, a priest, and the scribe; illuminated by Sargis Pidzak. 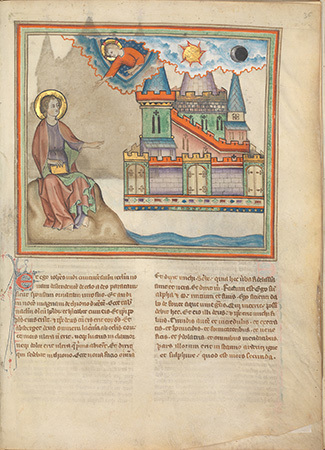 Text: tempera, gold, and ink on paper; illuminations tipped into the text: on parchment; 276 folios. 6¾ × 4¾ in. (17 × 12 cm). Armenian Patriarchate, Jerusalem. Mosque Lamp of Sultan Barquq. Egypt or Syria, 1382 – 99. Glass with gold and enamel. 13¾ × 10½ in. (34.7 × 26.8 cm). Victoria and Albert Museum, London (321-1900). Image: © Victoria and Albert Museum, London. Hebrew Bible. Catalonia (present-day Spain), first quarter of the 14th century. 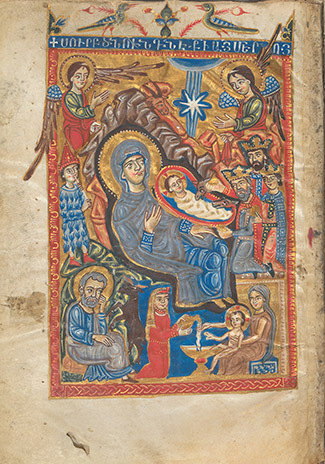 Tempera, gold, and ink on parchment; 500 folios. 15½ × 11½ in. (39.4 × 29.2 cm). Jay and Jeannie Schottenstein, Columbus. Next Year in Jerusalem. 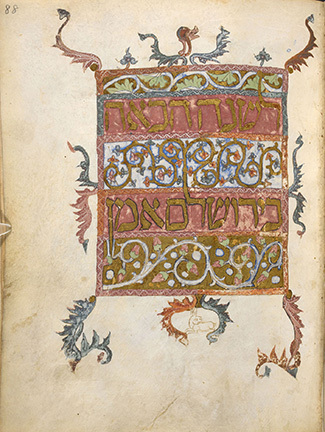 From the Barcelona Haggadah. Catalonia (present-day Spain), ca. 1360 – 70. Tempera, gold, and ink on paper; 163 folios. 10 × 7½ in. (25.5 × 19 cm). British Library, London. 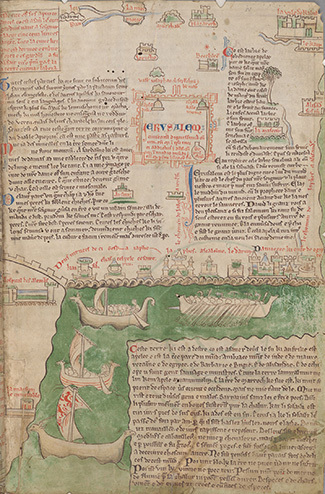 Image: © The British Library Board. Saint John Sees the Heavenly Jerusalem. From The Cloisters Apocalypse. Normandy, France, ca. 1330. 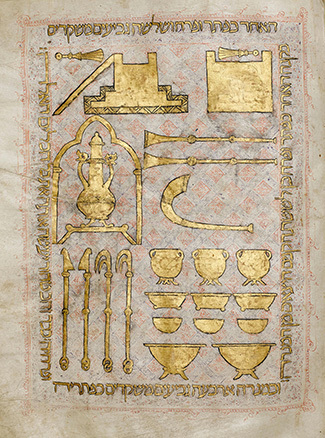 Tempera, gold, silver, and ink on parchment; 38 folio. 12⅛ × 9 in. (30.8 × 22.9 cm.) The Metropolitan Museum of Art, New York, The Cloisters Collection, 1968. Image: © The Metropolitan Museum of Art, New York. Chasse of Ambazac. From the Treasury of Grandmont Limoges, ca. 1180 – 90. 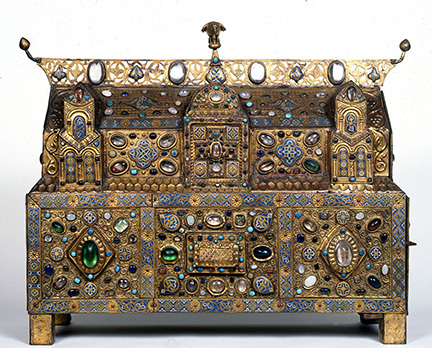 Gilded copper, champlevé enamel, rock crystal, semiprecious stones, faience, and glass. H. 23⅛ in. (58.6 cm), W. 31⅛ in. (79 cm), D. 10¼ in. (26.2 cm). Mairie d ’Ambazac. Image: © Region Aquitaine-Limousin-Poitou-Charentes, Service de l’Inventaire et du Patrimoine Culturel (photograph by Philippe Rivière, 1993). 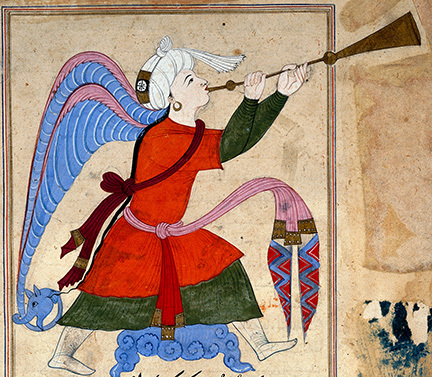 The Archangel Israfil (detail). From The Wonders of Creation and Oddities of Existence (‘Aja’ib al-Makhluqat) by al-Qazwini, (1202–1283). 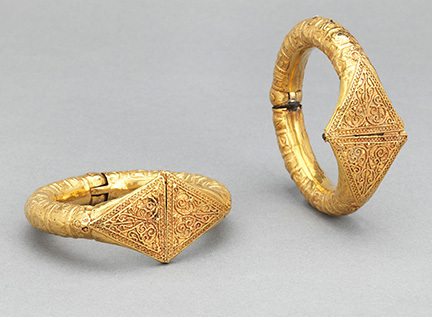 Egypt or Syria, late 14th – early 15th century. Opaque watercolor and ink on paper. 15⅜ × 9⅝ in. (38.9 × 24.6 cm). British Museum, London. Image: © The Trustees of the British Museum. The exhibition is a collaborative partnership between Barbara Drake Boehm, the Paul and Jill Ruddock Senior Curator for The Met Cloisters, and Melanie Holcomb, Curator, Department of Medieval Art and The Cloisters.